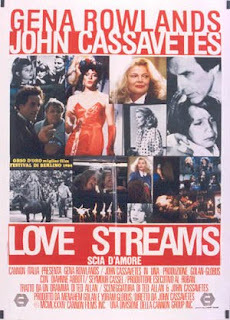 Fourth Row Center: Film Writings by Jason Bailey: Cassavetes: "Love Streams"
That may be the quintessential line of Cassavetes dialogue, a two-line summary of basically every film he ever made. It comes early in Love Streams, widely considered his last “real” directorial effort (he stepped in as a substitute director of 1986’s Big Trouble as a favor to his friend Peter Falk, and to finance another film of his own which he never lived to make). The film’s most shocking moment comes right at the beginning—with the film company logo. Surprisingly, Love Streams was financed by Canon Film Group and Golan-Globus, best known as the purveyors of Chuck Norris and Charles Bronson 80s actioners and the Breakin’ movies. But they occasionally got the prestige jones, and luckily Cassavetes was able to take advantage of it to film this adaptation of a play he’d directed for his L.A. theater group. The smooth, professional look of the film (with little to no handheld camera) is the primary difference between this and his 70s films; some of the camerawork—like a shot following Cassavetes’s car as he chases after his son—is downright stylish. But thematically and narratively, it is very much in the style of Husbands or A Woman Under the Influence—for better or for worse. If he found a way to fuse his loose style and love of character with traditional storytelling in his previous picture, Gloria (which I and I alone consider the best film he made), he’s back to his old, somewhat self-indulgent tricks here; that is to say, he’ll wander, he’ll meander, he’ll try out patience, but then he’ll end up with an extraordinary scene like his character’s drink with his son. You get rewards in his films, but you have to pay your dues. The film contains one of his most interesting performances, as a seemingly together guy mere moments from falling apart; Rowlands, as his emotionally needy sister, is brilliant, but that’s all but a given by this point in his filmography. Her bitter divorce with a character played by Seymour Cassel could very well be the eventual fate of their title characters in Minnie & Moskowitz; her pain at losing her daughter is heart-wrenching, in spite of how god-awful the actress playing that daughter is. There are other elements that don’t work either, like the strange fantasy dance/song sequence near the end, or the closing passages, which drag on too long—he’s worn us out before the clock has run down. But there’s much about it that is good, very good: the interplay between the two leads, the impatient rhythms of the dialogue, the film’s steady parade of charmingly unflappable cabbies. Of particular note is the last one, who helps Rowlands’s Sarah deliver an unexpected menagerie of rescue animals to her brother’s home (“Can you hold the goat… Where’s the duck?”) in a beautifully-executed sequence, perfectly paid off. Love Streams has all of the cons of Cassavetes’s other work, and all of the pros. He wouldn’t have wanted it any other way. Saturday Night at the Movies: "Blackmail"
In Theaters: "Shrek Forever After"
In Theaters: "Two in the Wave"
New on Blu: "The Edge"